The Arnott-designed aftermarket rear shock SK-3012 fits the third generation E-Class (W211 chassis) and first-generation CLS-Class (W219 chassis), both with AIRMATIC and with ADS including AMG models. Arnott’s SK-3039 is an Arnott-designed new rear shock for the 2003-‘09 Mercedes-Benz E-Class (W211 chassis) and 2005-‘11 CLS-Class (W219 chassis) without ADS or AIRMATIC and with or without Rear Load Leveling, excluding AMG models. The new Arnott shocks bypass the aging and often-problematic Adaptive Damping System (ADS) on these older vehicles and include a coil resistor, which plugs into the vehicle’s electrical system to eliminate any suspension dashboard warning lights. The new Arnott shocks, which fit both the left and right side of the applications, include a custom-valved and thoroughly road-tested damper, which provides the type of ride Mercedes owners expect, the company says. These shocks include a new polyurethane bump stop, new top and bottom mounts, which provide a tight fit, and a protective dust boot. 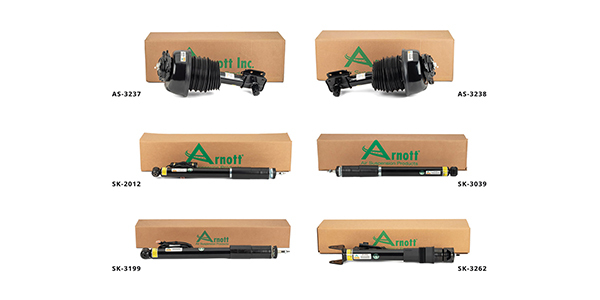 Arnott’s SK-3199 is a remanufactured OE rear shock for the 2003-‘09 Mercedes-Benz E-Class (W211 chassis) and 2005-‘11 CLS-Class (W219 chassis) AMG models with AIRMATIC and ADS and without 4MATIC and Arnott remanufactured rear OE shocks are inspected, steam cleaned, and spin blasted to bare metal before being recharged with new high-performance shock oil. Worn components, such as the piston, rod guides and seal pack are replaced before being repainted with corrosion-inhibiting paint. The shock and damping coil are dyno and functionally tested to assure OE performance. The U.S. designed and assembled replacement shocks come just months after the company released Arnott-remanufactured OE rear shocks SK-3197 and SK-3268 for the 2003-2009 Mercedes-Benz E-Class (W211 chassis) and 2005-2011 CLS-Class (W219 chassis) with ADS. Arnott’s new and remanufactured rear shocks are fully compatible with both the OE rear air spring and Arnott’s innovative rear air spring for the E-Class, which offers a significantly faster and easier installation than the OE, according to Arnott. Arnott also has introduced remanufactured OE rear shocks for the Mercedes-Benz R-Class (W251) with AIRMATIC and ADS. SK-3262 is an Arnott-remanufactured OE rear shock absorber for the left or right side of the 2006-‘13 Mercedes R-Class (W251 chassis) with ADS and AIRMATIC fitting both vehicles with 4MATIC or rear wheel drive, excluding AMG models. Also new from Arnott are remanufactured OE front air struts for the 2010-‘16 Mercedes-Benz E-Class (W212) and 2012-‘17 CLS-Class (W218). Arnott’s AS-3237 (right) and AS-3238 (left) are completely remanufactured OE front struts for the W212 chassis 2010-‘16 Mercedes-Benz E-Class and W218 chassis 2012-‘17 CLS-Class, both with 4MATIC, AIRMATIC and ADS and includes AMG models. For more information, visit www.arnottindustries.com.